WHY CHOOSE WALLOP KNIVES ? Wallop has a professional and experienced R&D team,which develops knives for optimal ergonomic function,comfort,balance and performance. -1.Core blade:Japanese AUS-10 damascus super steel. -2.Layers of steel:67 layers in total,66 premium high-carbon stainless steel layers ensure knives' exceptional strength, durability and stain resistance. -3.Rockwell hardness:With deep cold treatment HRC 602. -5.Exceptional design:Special hammered design on the blade,a beautiful masaic nail on the ergonomic grip handle. -6.Highly impervious fiberglass resin:The handle is made of highly impervious fiberglass resin,also called G10,it is better than wood material. -7.Honest pricing: Fair pricing system gives our customer the confidence to choose without any double. -8.Elegant package :Our package is made of superior quality gift box,you can give it to your relatives and friends as a elegant gift,that enhance your relationship more closer! -9.Professional application: WALLOP Vampire series knives can make life and cooking easier, both for simple home use and professional restaurant,hotal use. -10.Lifetime warranty: Try our perfect brand new knife,WALLOP customer service gives you 100% satisfaction,ensures money back against defect. 1. FINE DAMSCUS STEEL KNIFE: The knife core is made of durable Japanese AUS-10 super damascus steel, 67 layers , contents 1.1% carbon, rockwell hardness(HRC) 602. 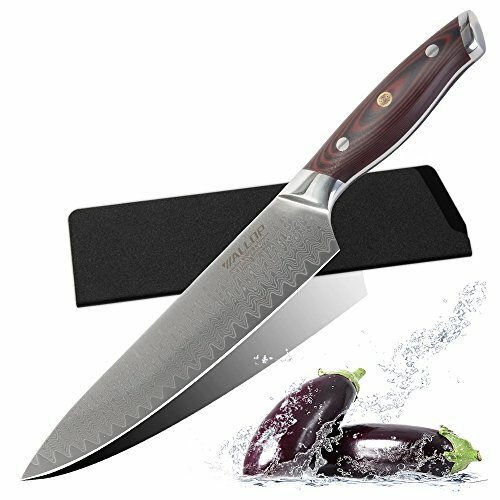 66 premium high-carbon stainless steel layers ensure its exceptional strength, durability and stain resistance, strong anti-corrosion & rust-free abilities, exquisite wave-line finish on the knife's surface reduces drag and minimizes stuck on foods, besides,its forges formed different, unique personality. 2.FINE GRINDING KNIFE EDGE :WALLOP knives insist on the handmade fine grinding V edge, the experienced craftsmen can keep the finest cutting feeling when cutting ingredients, but also take the strength of the edge into account,maintaining a perfect balance between sharpness and maximum elasticity, thus the sharp blade for will lock the food's original flavors and nutritions. 3. ERGONOMIC GRIP HANDLE: The elegant handle is equipped with red & black G10 material, highly impervious fiberglass resin,free from heat, cold and wet effects. Hand-polished ergonomic handle shape gives you a better comfort feeling with agility. A special mosaic nail embedded in the handle to reinforce handle, makes the knife more beautiful more stylish. 4. MULTIFUNCTIONAL USUAGE: WALLOP Vampire series knives can make life and cooking easier, it can be used to straight cut,push cut,rachel cut,side cut,roll cut,sawing cut, perfect for handling chicken, beef, vegetables , fruits, fishes and other foods in the kitchen. 5.100% SATISFACTION GUARANTEE:Try our perfect brand new knife,WALLOP customer service gives you 100% satisfaction,ensures money back against defect,lifetime warranty. If you have any questions about this product by WALLOP, contact us by completing and submitting the form below. If you are looking for a specif part number, please include it with your message.